Successful completion of a PhD program requires you to demonstrate the capacity to do high quality independent academic work. Below is a description of the PhD program milestones, designed to guide you in your training, determine the status and continuity of the your PhD program, and ensure your successful and timely completion of your degree. Under the direction of at least one area faculty, a research proposal must be prepared and submitted to the area PhD Coordinator outlining the tentative research questions to be explored in the first year research paper. This review reflects course work, research activities, and performance of GRA/GTA duties. The assessment reflects the input of all area faculty. A written assessment will be reviewed with the student and placed in his/her file. A written document describing the work must be available to all area faculty. Each student makes a presentation of his or her first-year paper at a meeting open to all College faculty. The presentation is assessed by all area faculty. Under the direction of at least one area faculty, a one page research proposal must be prepared and submitted to the area PhD Coordinator outlining the tentative research questions to be explored in the second year research paper. This review reflects course work (including PhD seminars), research activities, results of comprehensive exams, and performance of GRA/GTA duties. The assessment reflects the input of all area faculty. A written assessment will be reviewed with the student and placed in his/her file. Each student makes a presentation of his or her second-year paper at a meeting open to all College faculty. The presentation is assessed by all area faculty. Three outcomes are possible. (1) A student may pass the written exam; (2) A student may be asked to complete a follow-up exam or take additional course work focused on specific topics where the original written response was deficient. If the outcome of this follow-up activity is satisfactory, the student continues in good standing in the PhD program. The PhD Committee can be petitioned to adjust future milestones; (3) A student may be asked to leave the doctoral program. Upon successfully completing the Comprehensive Exam, a student is admitted to PhD Candidacy. At this time, a PhD student is formally permitted to begin the PhD dissertation. The review of students at the end of the third year reflects course work, research activities, performance of GRA/GTA duties, and any teaching experiences. The assessment reflects the input of all area faculty. A written assessment will be reviewed with the student and placed in his/her file. With guidance from the faculty, you will develop a Proposal for the PhD Dissertation. The Proposal should demonstrate that a you have the ability to (1) think independently, (2) take the initiative to develop and structure a research problem, rigorous solution, and analysis, (3) write-up the research in a clear, organized and concise manner representative of papers published in major academic journals, and (4) make a research presentation close to the quality necessary for successful job interviews. Failure to successfully present a dissertation proposal by the end of the fourth year will result in loss of funding for fifth year studies. Notification of the Proposal must be sent to all College faculty at least two weeks before the presentation. It must be held during the semester, which includes exam week. Once you have successfully presented a dissertation proposal, you must follow the final steps needed to take to complete the PhD degree. Visit the Georgia Tech Graduate Studies and Admissions office for policies and guidelines about your thesis. 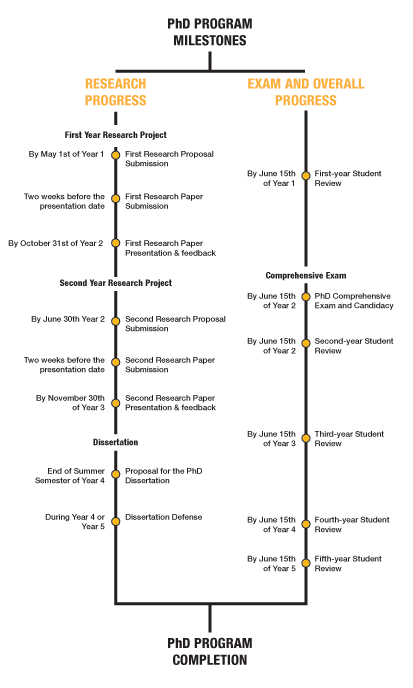 You are expected to complete their PhD Dissertations by the end of your fourth or fifth year. You will present your doctoral research at an oral defense open to the entire faculty in the Scheller College of Business.You will qualify for a PhD upon successful defense of your dissertation.